It doesn't happen very often in life, that utterly unexpected sequel that drops in your lap years after the original book came out. Most of the time, you discover series you love and blow through them at lightning speed and then are left to pick up the shattered pieces of yourself when the whole glorious thing is over. Or you stumble across gold with the very first book and are forced to not-so-patiently wait one year (or more) for each new installment. But occasionally an author hits you with one out of left field. 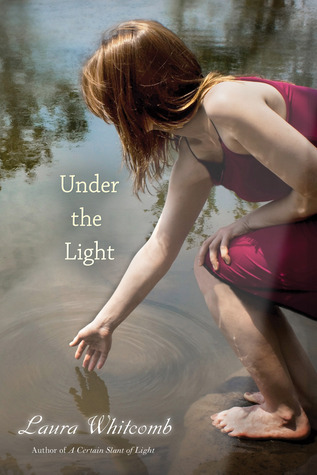 I first read and adored A Certain Slant of Light not too long after it was published in 2006. It felt like a perfectly contained standalone novel to me at the time. And it still is. If you only read that one, you will be left content. But there are a couple of . . . I hesitate to call them side characters . . . that you certainly would not object to spending more time with, if you know what I mean (series addicts: I know you know what I mean.) So when I discovered that Laura Whitcomb was writing a companion novel (sequel of sorts) told from one of those character's perspectives, well. I was more than okay with it. Jenny is not okay. Having returned to her body after unexpectedly vacating it for a period of time, she has no real recollection of what happened in the interim. All she knows is that she was . . . gone . . . for awhile. And when she came back, there was a boy who seemed to know her but not know her. Billy held in his hand a Polaroid of the two of them together. They looked happy. They looked like they belonged together. And yet Jenny and Billy do not know each other. They don't have the kind of shared memories that the photograph suggests. Instead, what they have is a disturbingly similar (if different in the details) history of shame, painful family issues, and a longing for escape. And, as it turns out, Billy was gone for awhile, too. What they begin to discover is that a fair bit happened while they were away. And one of the presences involved is not through involving herself in their lives. Meanwhile, real life has gone on around them. Jenny's father has moved out and is threatening (as he always has) to control everything about her life. Billy's brother is suspicious (as he always is) of his little brother's activities. The two lost teens attempt to get to know one another and, perhaps, puzzle out their bizarre connection. But it seems the ramifications of the events they have no memory of will impede their fledgling attempts and impact their presents in very real and unsettling ways. And that's where every ghost story begins, with a death. He lifted his foot and rested it over my ankle, gently pinning me down. Then he pointed into the heavens. "Want to go there?" "That star." He gave his finger an extra stretch toward the dozens of stars in that general direction. "The one by those other two stars." "What do you mean?" I lifted my arm so it was touching his, our hands and fingers aligned, and pointed. "That one?" "No," he complained. Then he swiped his fingers across our view of the sky, like he was flicking away a speck of dust or a drop of water, and the night surged forward. The stars, staying perfectly aligned, curved across the sky--time had sped into the future an hour. I gasped at this and grabbed his hand, pulling it back toward our bodies as if he might accidentally throw the earth off its rotation. The stars slowed again, appearing to have stopped. "How did you do that?" I whispered. "I took us somewhere we hadn't been yet," he said. "Forward in time." He said it so matter-of-factly, but the idea made me shiver on the inside. "Just a little," he reassured me. "Thats . . . so cool." I pointed at one particularly bright star and gave it a push with my fingertip in the air. The map of stars glided forward again, constellations staying aligned as they gracefully passed over us, not a long way, just a bit into the tail of the night, an hour or two closer to morning. He made a sound of alarm, a fake cry, and then laughed, "Here." He lifted his arm to mind, our hands together, our index fingers pointing up. As one, without saying aloud what we would do, we moved the stars a few minutes westward, then froze. "Look what we can do together," he said. And so while the story spends a rather unnecessary amount of time detailing Helen's anxieties and desires for her former host, it redeems itself by winding its way around again to the heart of this sequel--two shell-shocked and lonely young people who find each other and, in each other, hope. Babbling About Books, and More - "The ending will make you smile and possibly shed a tear." Ink and Page - "I felt lulled, pulled along, enchanted." The Midnight Garden - "This sequel is astonishingly complete and wholly satisfying." The Readventurer - "The last chapter is just gorgeous. But the plot, the plot! Where art thou?" It really was, Sandy. I was surprised how good it felt to be back. And she knows how to end a book, I'll give her that. It's a lovely ending. oh my goodness im so excited!! i read a certain slant of light years ago and loved it and i cant wait to read this one! I know!! It's thrilling she wrote a follow-up. Hope you love it. I'm working on a review of this at the moment and I find it funny that in my linkage I quoted basically the same exact excerpts of The Midnight Garden and Readventurer reviews. Great minds think alike, yes? I completely agree with you on the overall loveliness of this book. I didn't mind Helen's POV but Jenny and Billy's story took my breath away. She has a gift for the breath stealing. She really does. The ending had me smiling. This one didn't hit me as hard as the first book but I love the message of hope, peace and love. I wish that James was around though. I'd like to think he and Helen are in Heaven together happy. How could it not? She kills it with her endings. Yeah, I felt the same. I don't think I realized how resolved I felt Helen & James' story was. Wanted them together and the focus on Jenny & Billy. But so lovely. Yes, I completely agree about Helen being an intrusion. Jenny and Billy on their own were enough. A framing with Helen at the beginning and end probably would have been fine (because that last chapter was gorgeous). I did understand Helen and Jenny's attempts at communicating with each other, though. So, basically, I said the same things as you in my review. I like that idea of a framing with Helen, Akilah. That would have worked for me nicely. And that last chapter really was something. I adore her endings. Isn't it? Her writing just inspires that word in readers, I think. She has such a light touch.